A fireball erupts from the south tower of the World Trade Center in New York City after a hijacked passenger jet crashed into it on September 11, 2001. Another hijacked jet had crashed into the north tower about 15 minutes earlier. Both of the 110-story skyscrapers soon collapsed completely. Hijackers crashed a third plane into the Pentagon in Arlington, Virginia, and a fourth hijacked plane crashed in Pennsylvania. The terrorist attacks, which killed about 3,000 people, were the deadliest in United States history. 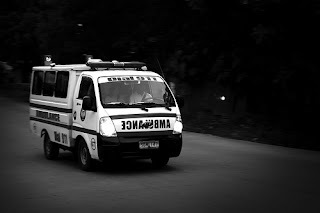 On the other hand, Davao City is one of only three areas in world, after US and Canada, to have the Integrated Emergency Response System 911, a fully integrated, computerized response system linking the people of Davao City to the emergency resources of the government. Davao City received an award for its Project 911 from the League of Cities in the Philippines in 2003, as one of the Top 25 Best Practices in the Philippines.